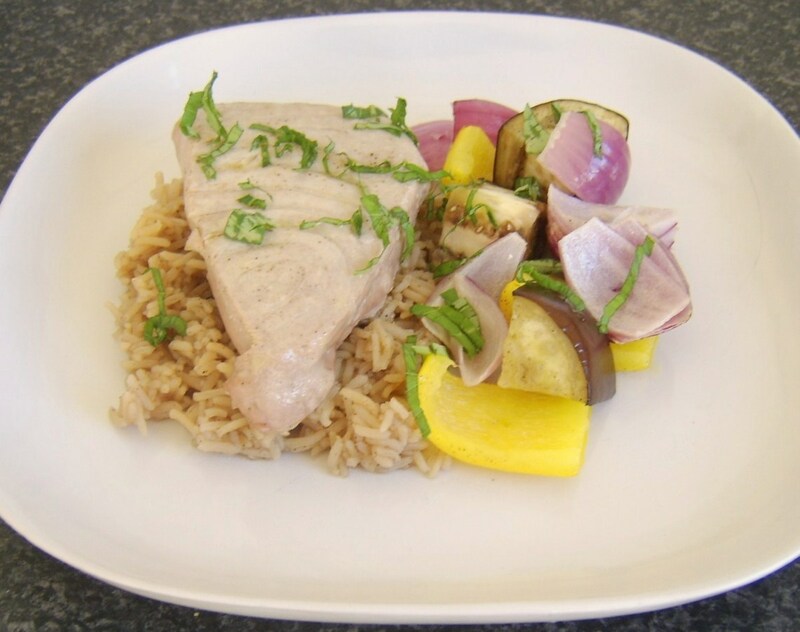 Fresh and canned tuna provide very different eating experiences. 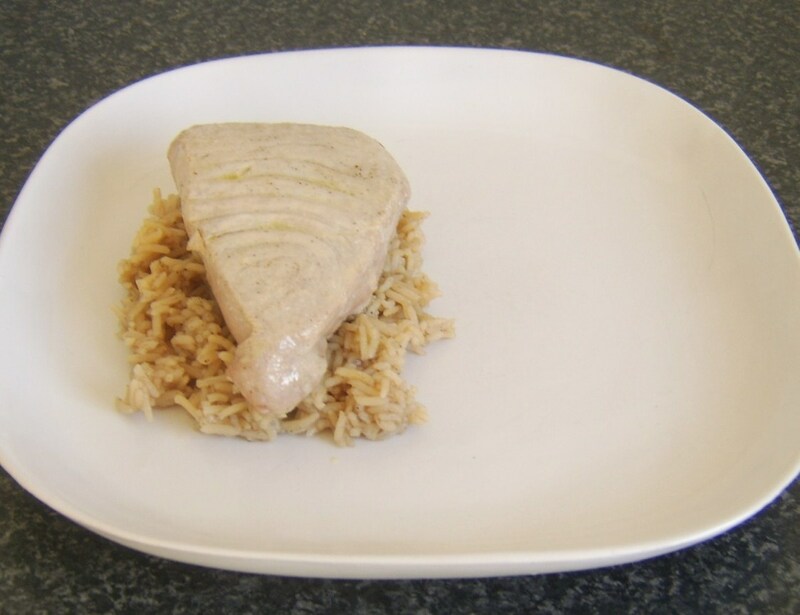 The canned option for many tuna connoisseurs represents the fish at its worst: dry and overcooked. This is largely because it is not only cooked before it is canned, the canning process itself further cooks the fish. On the other hand, fresh tuna for many lovers of the canned variety often represents a non-justifiable food expense and can be deemed to be undercooked when served in restaurants. 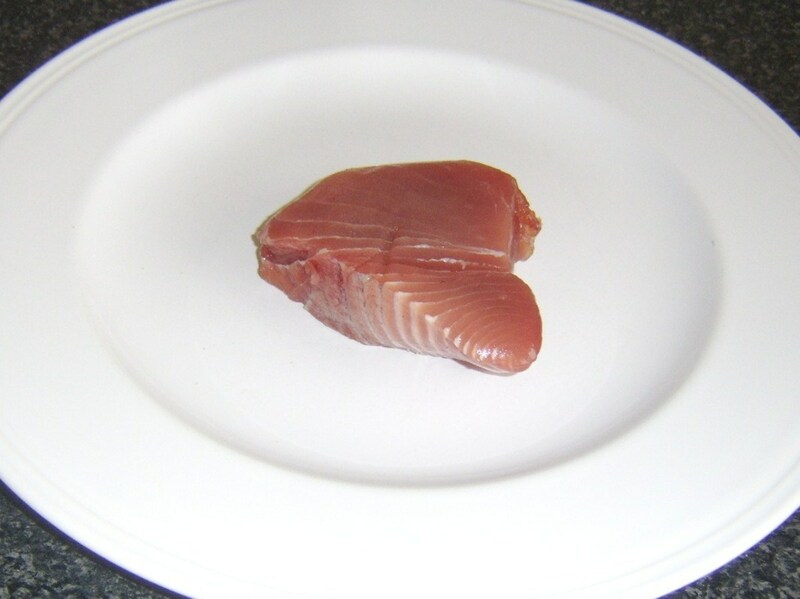 Fresh tuna is actually widely believed to be at its best served pink in the centre and merely seared to some extent on the surface. Do you prefer tuna canned or fresh? Pour a couple of tablespoons of vegetable oil in to a roasting tray and put in the oven to preheat both to 400F/200C. 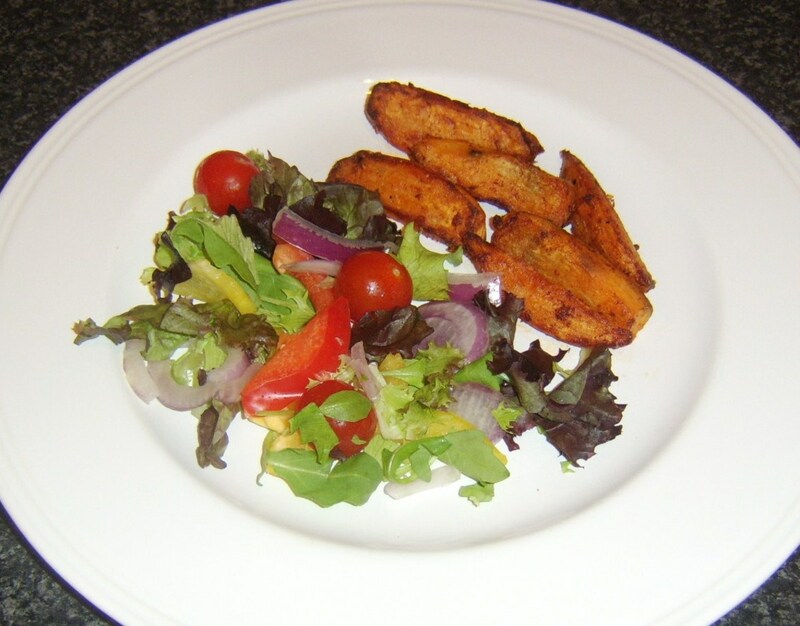 Add the sweet potato wedges to the tray, season with salt and pepper, stir carefully through the oil and bake for twenty minutes, stirring again half way through cooking. Prepare your salad. The salad in this instance consisted of some chopped yellow bell pepper and red onion, mixed green salad leaves and cherry tomatoes. 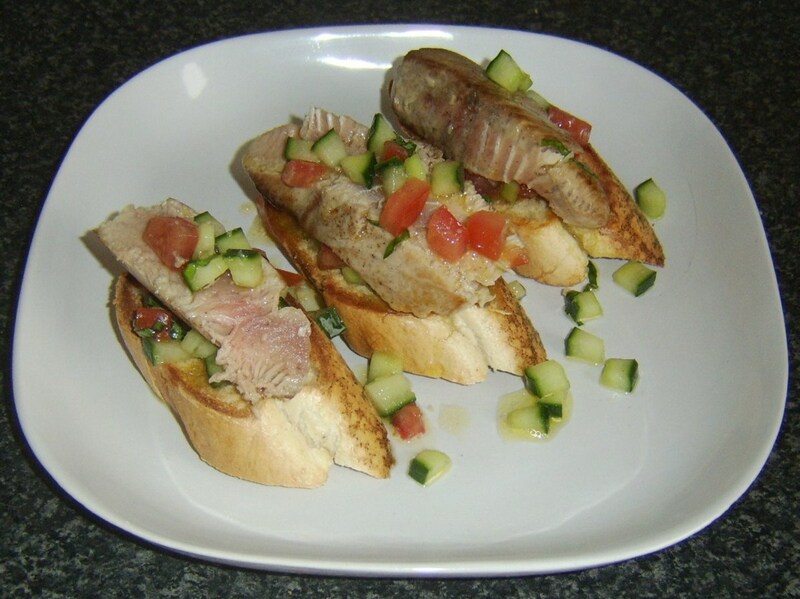 Use one teaspoon of the paprika to rub gently over both sides of the tuna. Season further with a little salt and pepper. Put the grated garlic clove and remaining spoonful of smoked paprika in to a bowl. 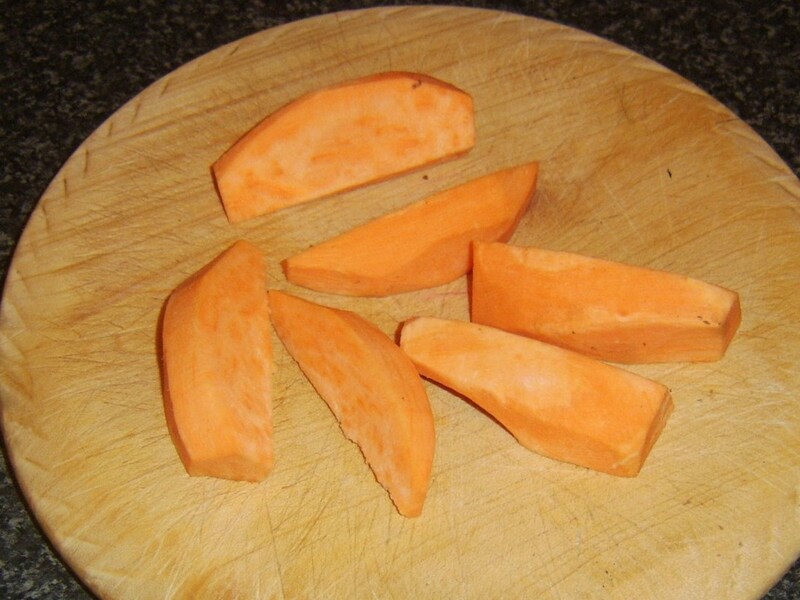 Take the sweet potatoes from the oven and lift with tongs to deposit them in the bowl. Stir very carefully with a wooden spoon. 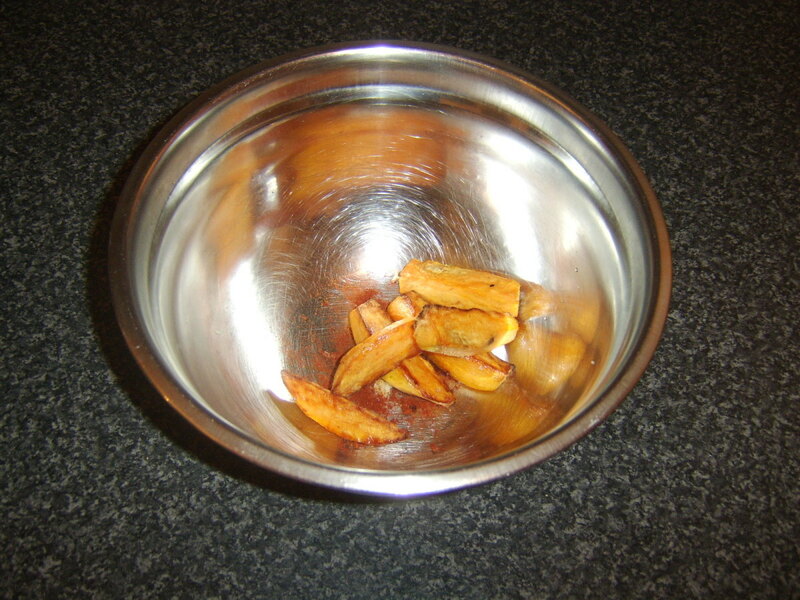 Transfer the sweet potato chips to a plate covered with kitchen paper to drain. Bring a little vegetable oil up to a high heat in a non-stick frying pan. 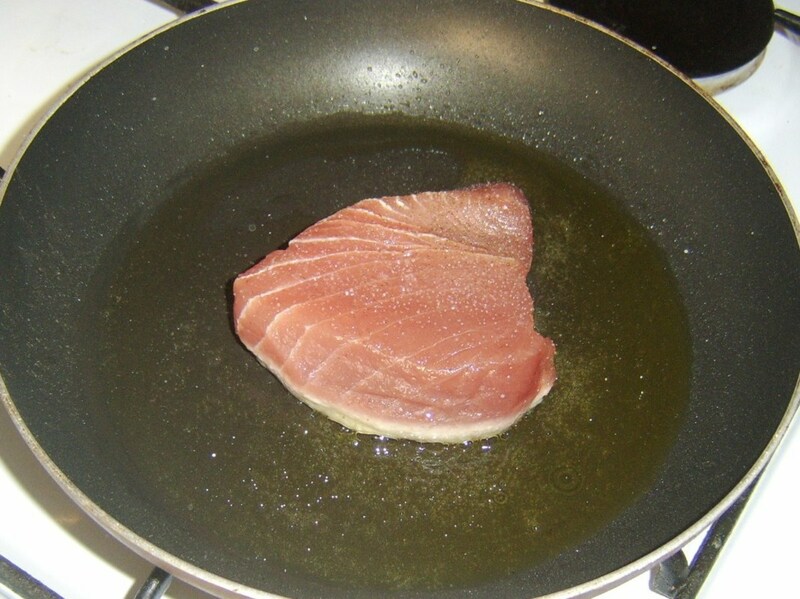 Fry the tuna for about a minute each side, until it looks as though it has cooked one-third of the way up in each instance. Plate the salad and fries and lay the tuna on top of the salad. Garnish with the sliced basil leaves. 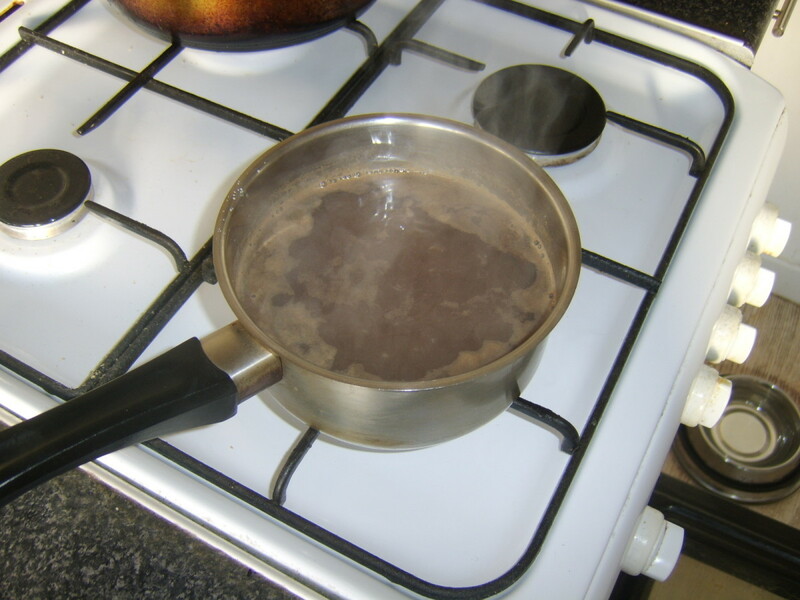 Bring a pot of water up to a boil. Wash the rice under running cold water and add it to the pot along with the Lebanese 7 spice. Bring back to a simmer for 10 to 12 minutes. Thread the vegetable pieces alternately on to a skewer. A metal skewer is used in this instance. You could use a wooden skewer but if so, remember to soak it in cold water for 10 minutes first or you risk it burning under the heat. Lightly oil a grilling pan and bring your grill/broiler up to a high heat. 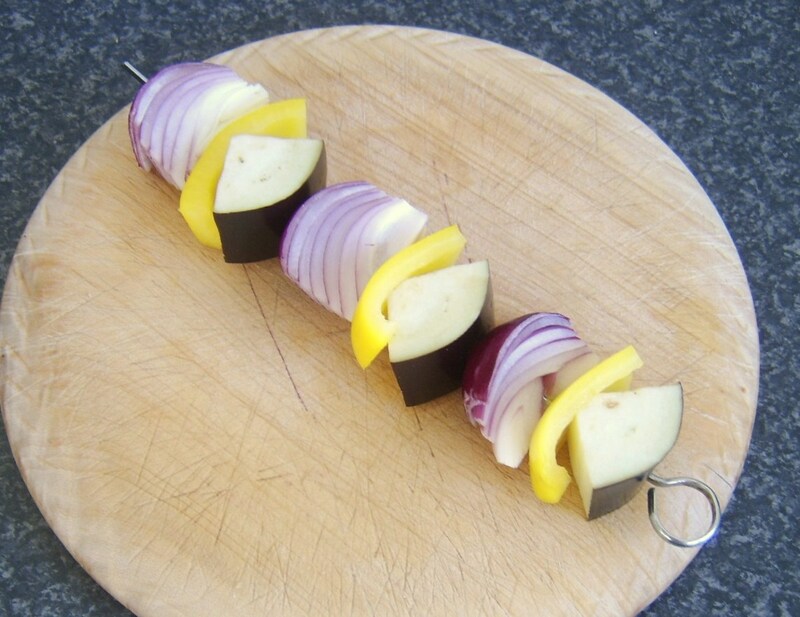 Lay the vegetable skewer on the pan and lightly brush with olive oil. Cook for two minutes. 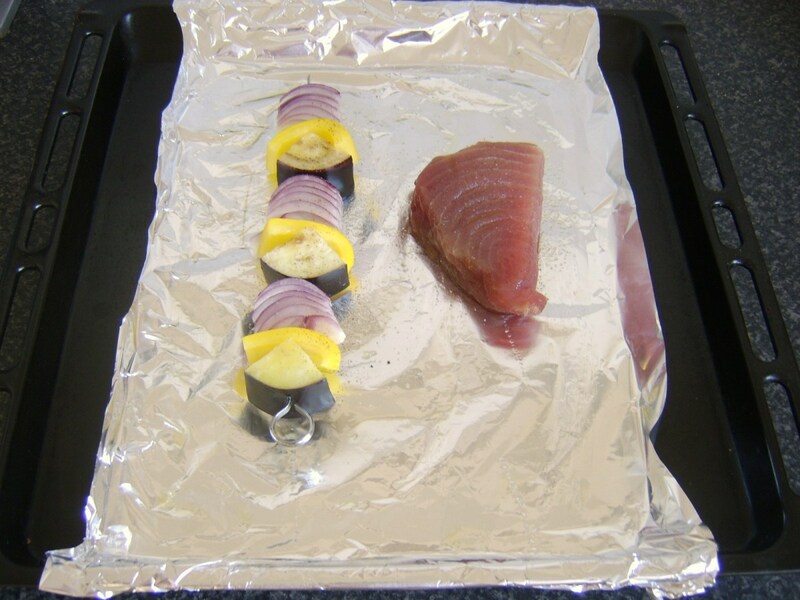 Turn the skewer (protecting your hand from the heat) and lay the tuna alongside. Put back under the heat for two more minutes, turning the tuna half way through. 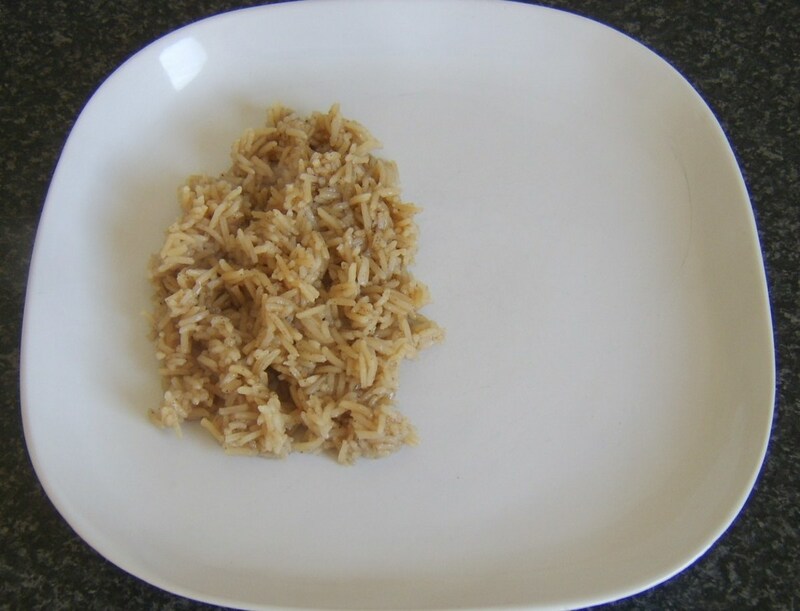 Drain the rice and spoon on to a plate as a bed for the tuna. Carefully lift the tuna on top. 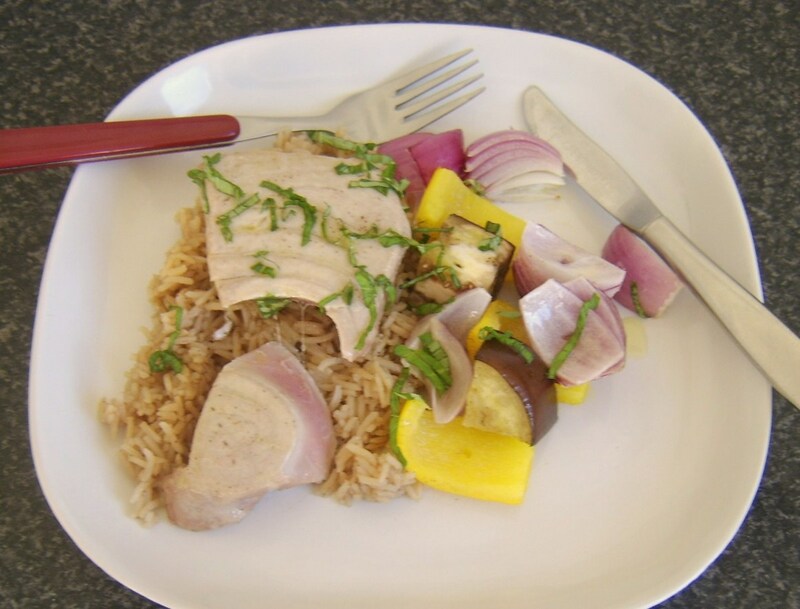 Sit the skewer next to the tuna and rice, using a fork to slide the vegetables off and on to the plate. Garnish with the sliced basil. If practical, you could prepare the salsa a couple of hours in advance and refrigerate it, covered with plastic wrap until it is needed. 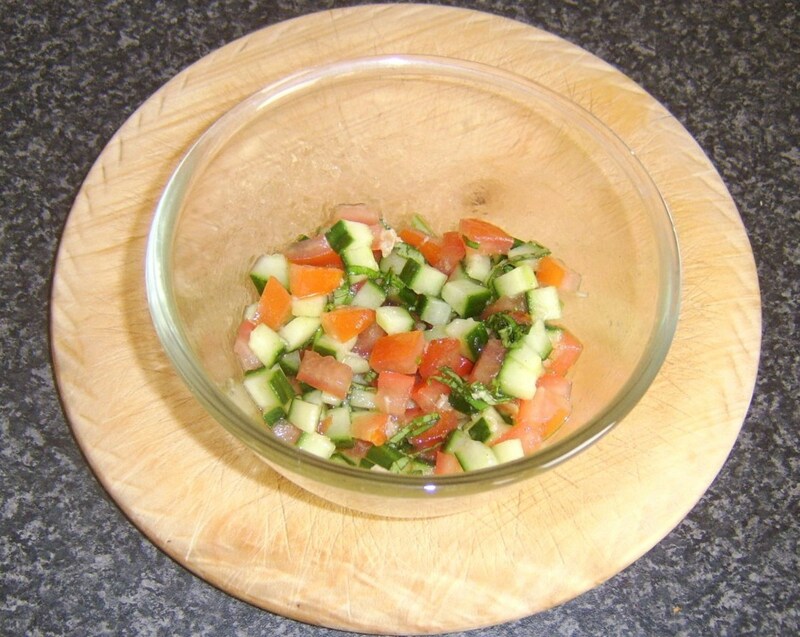 Simply add the tomato, cucumber, chilli powder (if appropriate), the grated garlic clove and the basil to a mixing bowl. 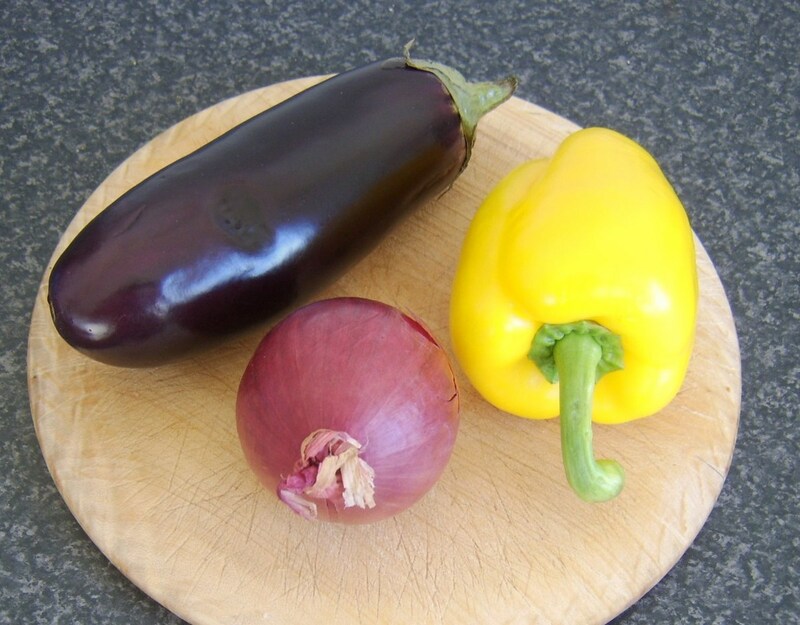 Season with salt and pepper, add a splash of extra virgin olive oil and stir well. 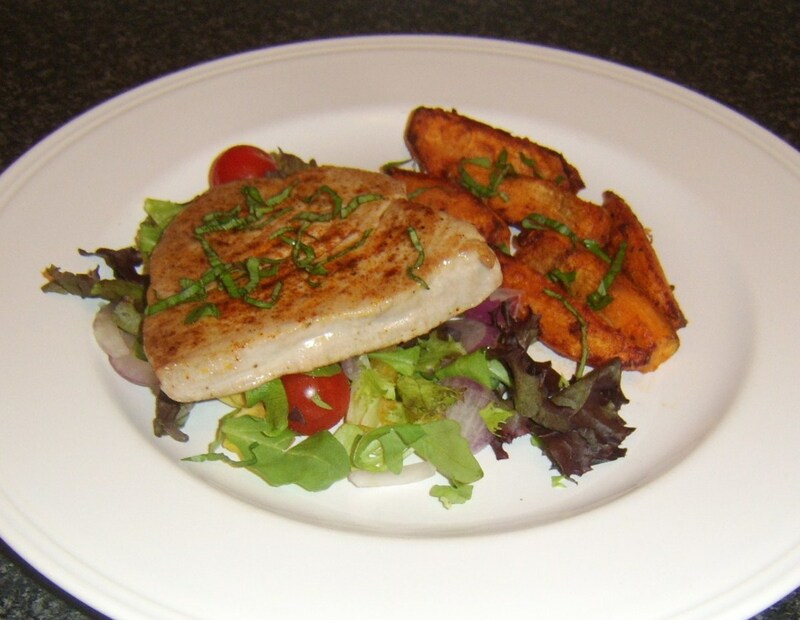 The tuna fillet in this recipe is deliberately a little bit bigger and thicker than in the previous two recipes. This is because it is sliced in to three pieces after it is cooked. 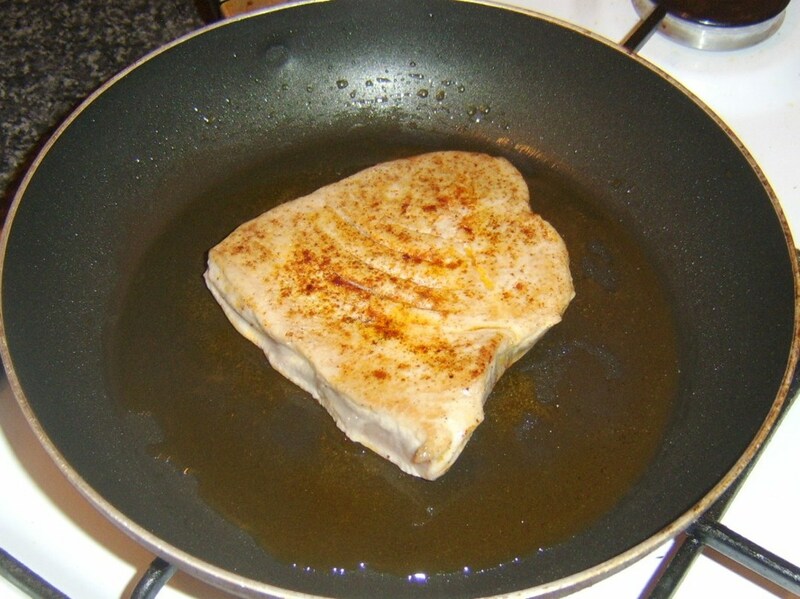 In this instance, the fillet should be seasoned and fried for about a minute on all four sides in a hot pan with a little oil. 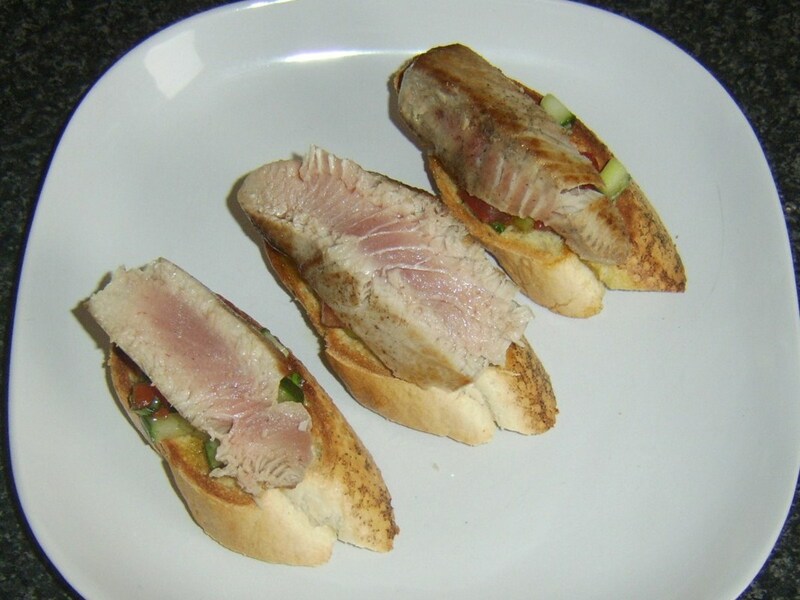 When the tuna is in the frying pan, put the bread on to toast. 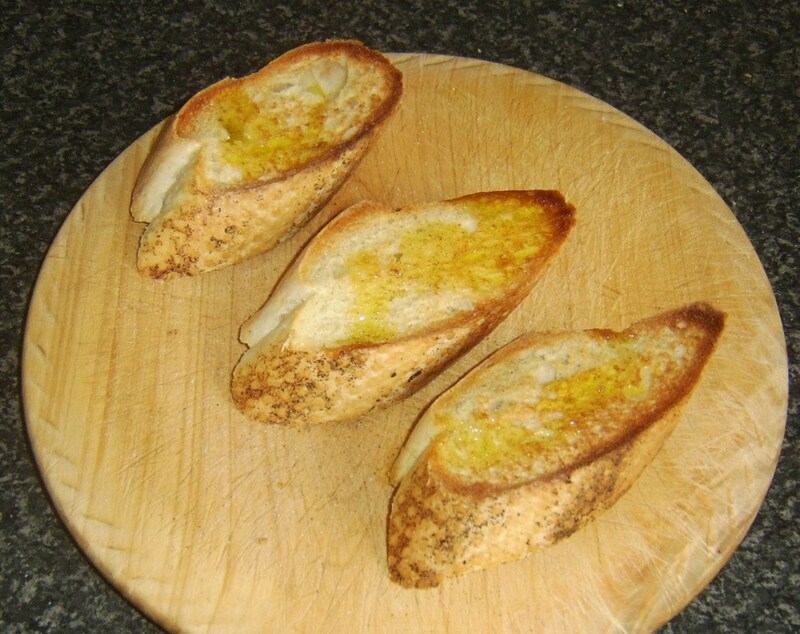 Rub the hot toast with the lightly crushed garlic clove before drizzling with a little oilve oil and seasoning with salt and pepper. 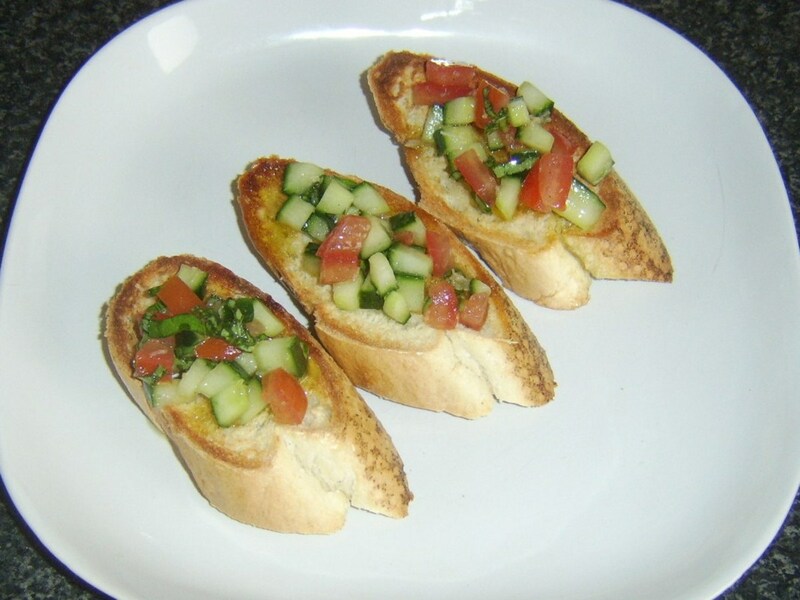 Lay the slices of toast on the serving plate and spoon some salsa on to each one. 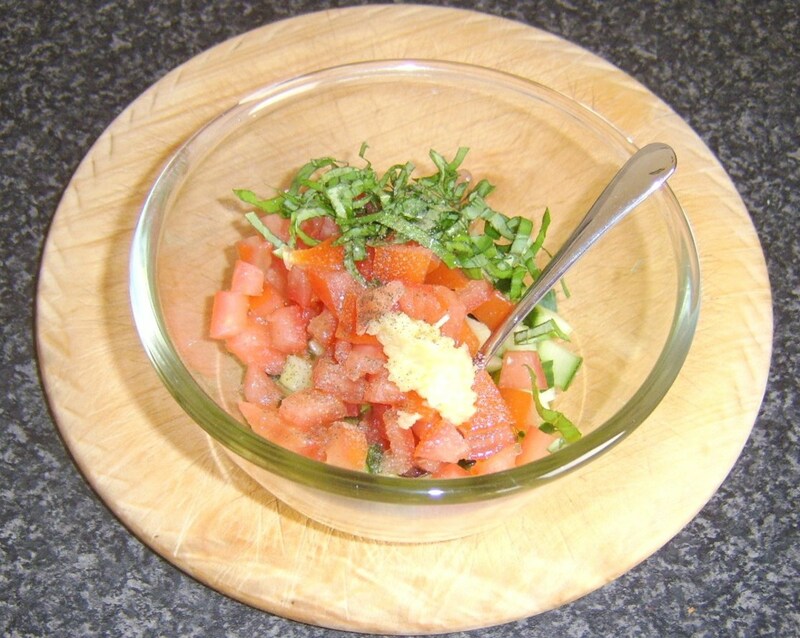 Lift the tuna to a chopping board and slice in to three even portions to sit on top of the salsa on the toast. Drizzle with any remaining salsa by way of a garnish. Thank you for visiting Barbara and I hope you enjoy your fresh tuna experience as much as I regularly do. 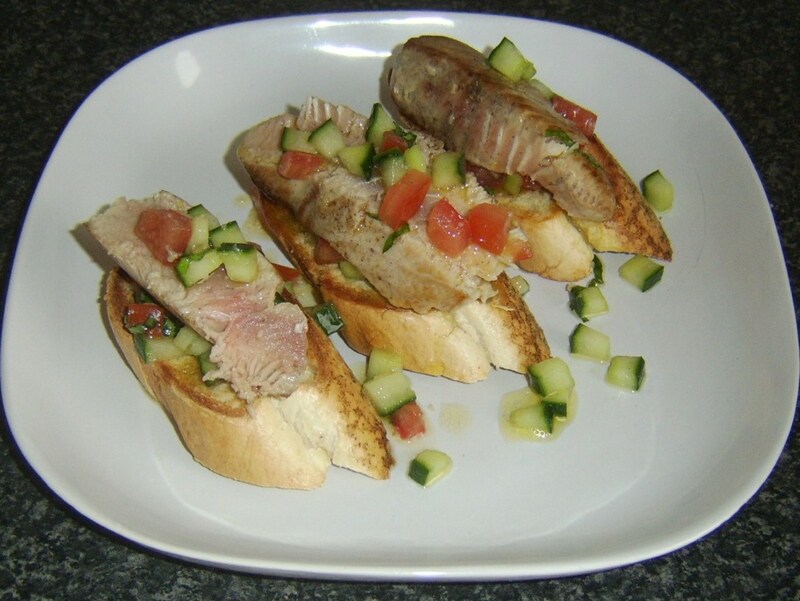 I confess that I've never tried fresh tuna because I didn't know how to cook it. I don't have a way to grill it. You have given me some options here. Thank you. Great recipes and I am definitely going to try this one out! Hi, lovebuglena. Thanks for visiting and commenting. I'm not a fan of canned tuna at all but love tuna served as sushi. Don't unfortunately have a Japanese restaurant near where I live at the moment but take every opportunity I can to enjoy it if travelling. Thanks, randomcreative. 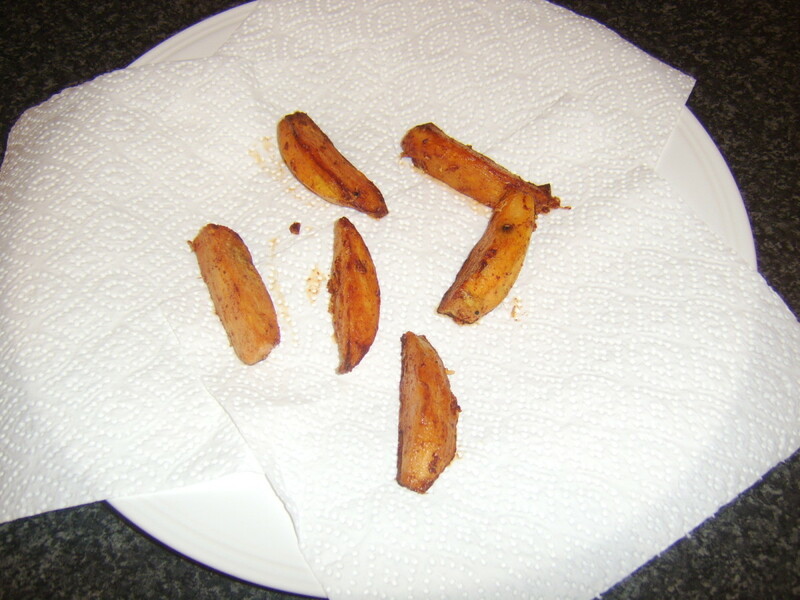 The sweet potato fries did work really well in this recipe. Hope you enjoy it if you give it a try. Sounds delicious, moonfairy. You definitely like it cooked in a similar way to I like it. The noodle salad sounds like a great side. Thanks for stopping by. very informative hub! Your recipes sound delicious. 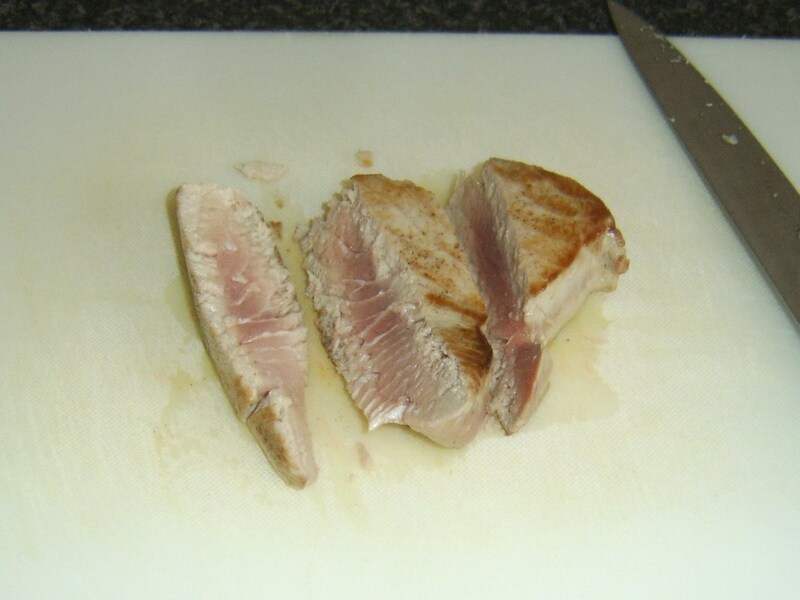 My husband and I grill tuna quite often and we love ours seared on the outside and very rare on the inside. 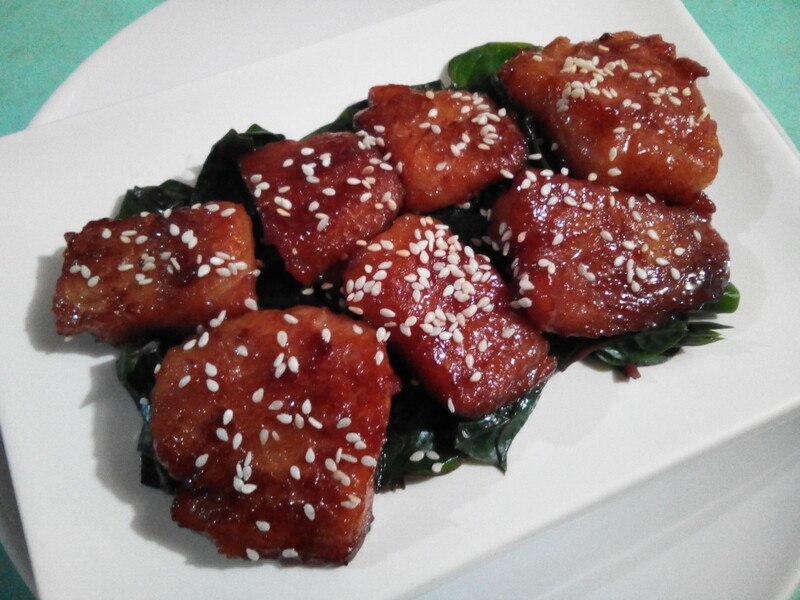 Our favorite recipe includes soy and sesame and we have an Asian noodle salad as our side dish. It's so good!!! 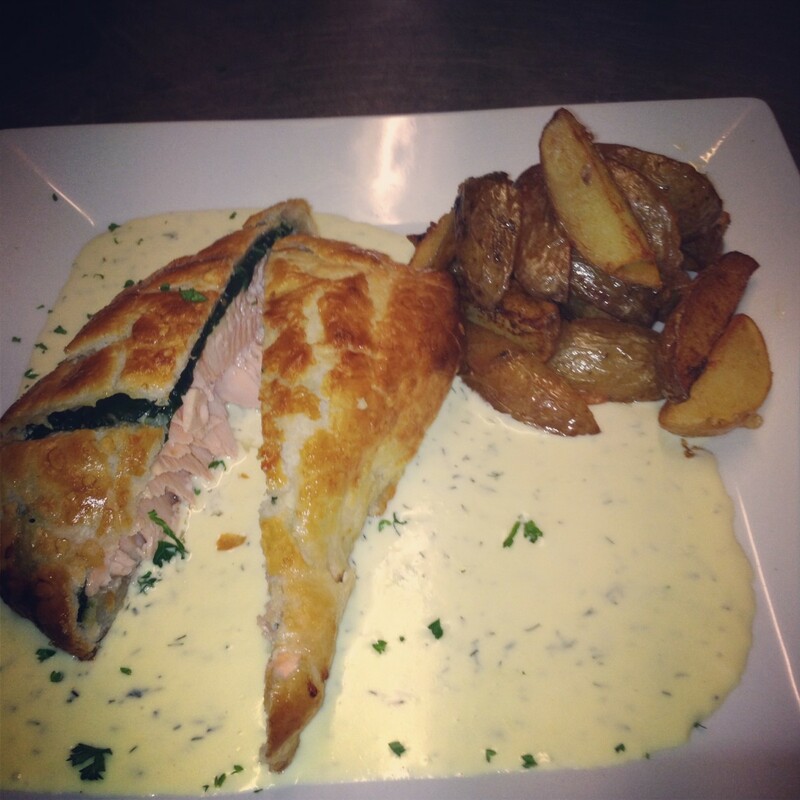 Sweet potatoes and salmon sounds like such a great pairing! I love the other vegetable options that you've presented here, too. Thanks for another awesome set of recipes! I love canned tuna but I enjoy fresh tuna as well. If I ever go to a Japanese restaurant for sushi I always order white tuna sushi. It is so good. Prefer it to the red tuna actually. But I love red tuna on a bed of green leaves. 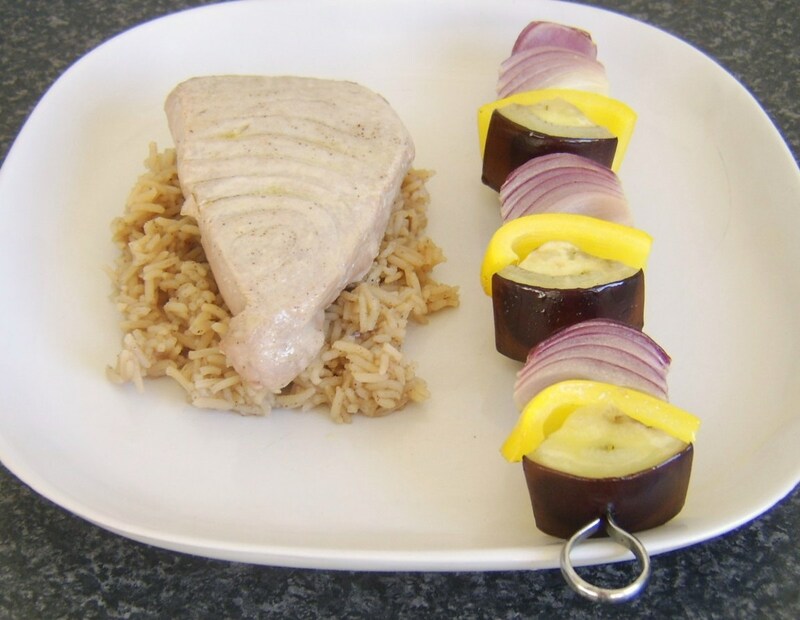 I think the tuna is marinated but I could be wrong. At any rate it is not cooked that much I know. Great hub and great recipes... Certainly makes me want to give this a try. Thanks for sharing. Voted up and shared with followers.